On a clear day, looking out over the sloshing blue-gray swell of Gowanus Bay from Sunset Park’s waterfront, you can see the Manhattan skyline. Pivot slightly and you’ll find eight nearly identical warehouses, erected between Second Avenue and the Gowanus Expressway. Weave through the alleyways between them to sit in sterile parks under the illumination of crisscrossed Christmas lights, or trek inside to drink at a sake brewery or drop $500 on a Charlie Hat from Teressa Foglia. Outside, semi-trucks rumble over potholes, and the awnings of bodegas fade in the sun. This is Industry City, but it wasn’t always. In the middle of the 20th century, before the tech start-ups moved in and the blue-collar jobs dwindled out, this site — then known as Bush Terminal — typified a gritty, bygone version of the American Dream. For Yvette Aguirre, whose mother immigrated to Sunset Park in the 1940s, the network of former factories is more personal. It is where her family made a living, producing food with Safeway or sewing sequins onto wedding dresses for Macy’s. Aguirre grew up to be the principal of two different neighborhood schools, P.S. 169 and P.S. 24. She also owns a brownstone in the neighborhood, but she fears for her neighbors who aren’t as fortunate. A revival of the Brooklyn waterfront’s industrial past, upgraded for the 21st century, is the hope of UPROSE, a community organization that has been active in the neighborhood for decades. It wants to make Industry City a regional hub for Green New Deal-related production. PLANTING A FLAG: Locals opposing plans to double the size of Industry City rally outside a wine tasting at the former manufacturing hub in March. Credit: Erin Sheridan. 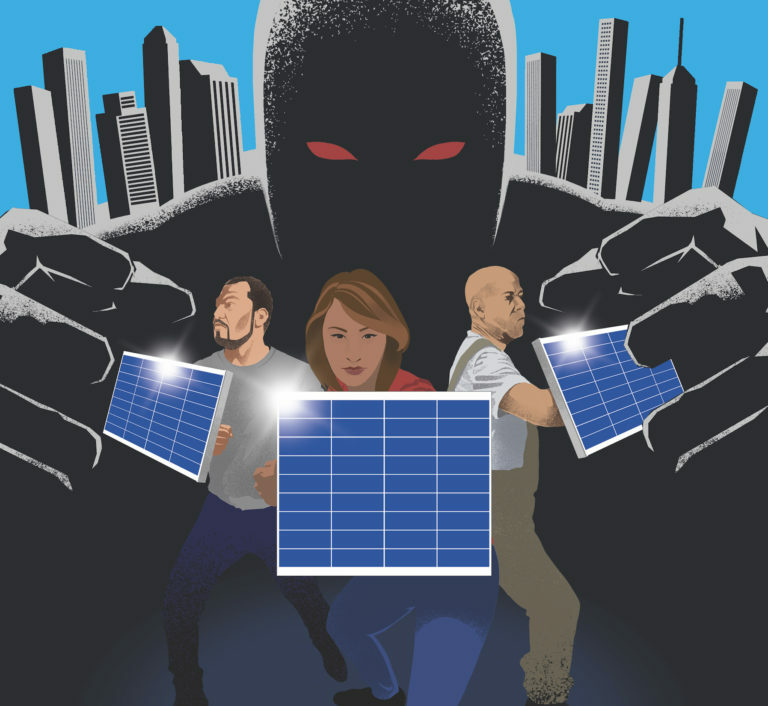 The group envisions a future where the industrial waterfront accommodates not only artisanal wine and candle shops, but the assembly of solar panels and wind turbines, which would provide thousands of good-paying green-collar jobs for local residents. Industry City’s owners — a partnership between Jamestown L.P. and Belvedere Capital — have a different vision. 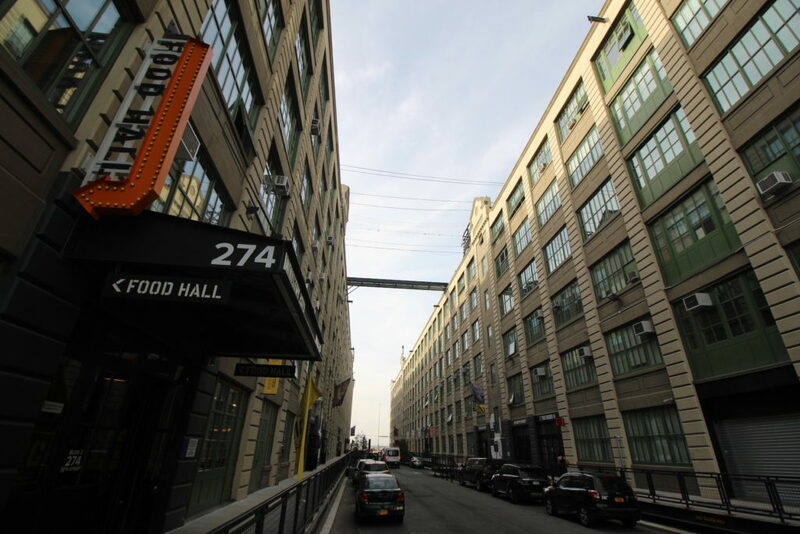 In February, CEO Andrew Kimball filed a long-awaited application to rezone Industry City and add an additional 1.45 million square feet of space to the site. This plan envisions the construction of two new hotels with 420 rooms, a parking lot, classrooms and more retail space — and the death of UPROSE’s nearly decade-long dream of reviving manufacturing on the site. The application was withdrawn March 11 at the request of Carlos Menchaca, Sunset Park’s City Councilmember, and Community Board 7. In a letter to Kimball, they argued that the Uniform Land Use Review Procedure, a public process to review land-use changes, did not allow enough time to study the potential effects on displacement and gentrification. They would not support any rezoning, the letter warned, until they can finish independently evaluating those effects. 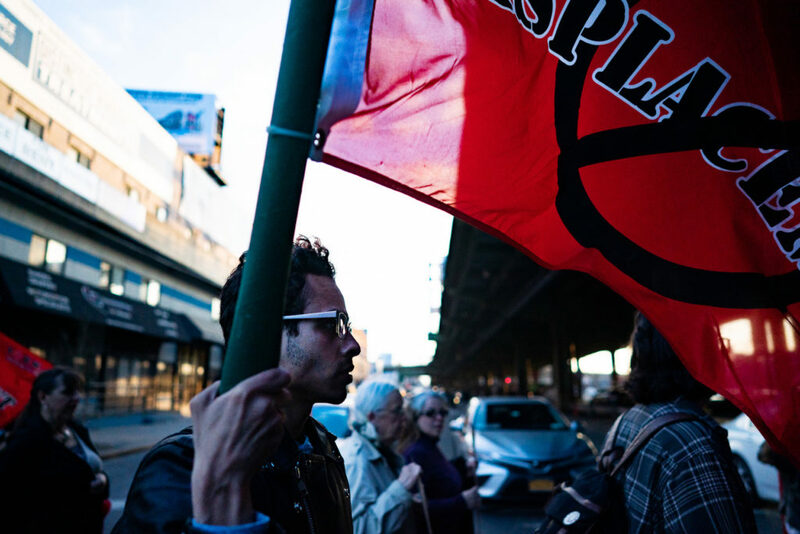 On March 15, UPROSE took its campaign to the streets. Members marched to the Sunset Park waterfront, rallying opposition to the rezoning while vowing to disrupt a wine-tasting event slated to take place at Industry City at the same time. Young and old raised banners. “Sunset Park No Se Vende,” their synchronized voices rang. Sunset Park is not for sale. They passed blocks of auto shops and public schools as they crossed into Industry City, where their chants resonated amongst outlet stores and food purveyors and the stares of onlookers. Sharline Dominguez, a 25-year-old paralegal assistant with the New York Legal Assistance Group, was on her way to the gym when she bumped into the protest. Dominguez and her family immigrated to Sunset Park from the Dominican Republic in the 1990s, when she was a little girl. They were pushed out south to Bensonhurst by swelling housing costs and then across the Hudson to New Jersey. 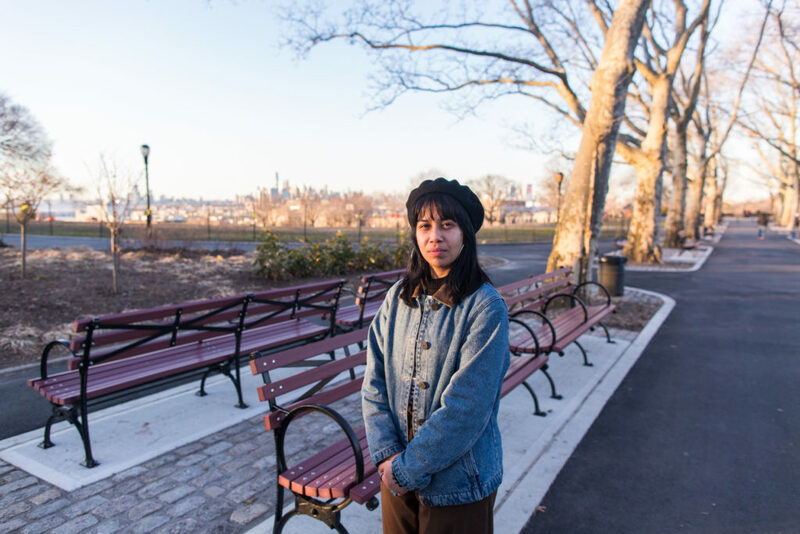 UPROOTED: Sharlene Dominguez was forced to leave Sunset Park where she was born and raised when rising rents made it unaffordable. She is not alone. Credit: Leonardo March. For UPROSE executive director Elizabeth Yeampierre, the cost is in lost opportunities. The organization has hired the Collective for Community, Culture, and Environment — a consulting firm of Pratt Institute researchers — to explore how Industry City could be repurposed for a sustainable and environmentally just future. Its findings will be made public, Yeampierre said. She believes the fight for a greener future is also a battle to thwart the kind of gentrification that has steamrolled so many other New York City neighborhoods. Others remain skeptical. Tom Angotti, a professor emeritus of urban policy and planning at Hunter College and the author of Zoned Out! Race, Displacement, and City Planning in New York City, doubts Industry City’s claims that locals will not be harmed by the site’s rezoning. For New York’s industrial waterfronts, the rumblings that would later erupt into a Pompeii-esque explosion of gentrification were first felt in the 1960s, when the Port of New York decided to move to New Jersey. That left the old areas of docks, warehouses and factories in a state of decay until it became profitable to scoop them up and shine them off for residential and commercial development. DEVOURED: Tacos to dim sum are on offer at Industry City’s Food Hall. But the surrounding neighborhood’s impressive diversity is rapidly disappearing. Credit: Shinya Suzuki. According to Angotti, the fate of UPROSE’s green vision depends on two factors: the economy and politics. With many experts predicting a recession in the near future, there may be less investment capital to funnel into billion-dollar development projects like the one Industry City executives hope for. Additionally, as the Democratic Party moves to the left, and as Mayor Bill de Blasio and Governor Andrew Cuomo reel from the loss of the Amazon headquarters in Long Island City, supporters of rezoning may be less willing to lay their cards on the table. Still, the outcome remains uncertain, especially if Industry City executives return with a revised proposal for the rezoning process, said Angotti. Maybe the threats of climate change will be enough to propel a successful campaign against the developers behind Industry City. Maybe things like Sunset Park’s charming housing and crisp views of Manhattan and Lady Liberty will ultimately make locals dig their heels into the ground.